Motley Cue bassist Nikki Sixx has revealed his recording plans for a new music project planned for a 2019 release. The rocker – who “unofficially” retired from the road last year – says he’s been inspired by his time away from touring and playing live shows. While the group went on hiatus last year, there’s no word yet if the bassist’s trilogy project may include his Sixx:AM bandmates DJ Ashba and James Michael. 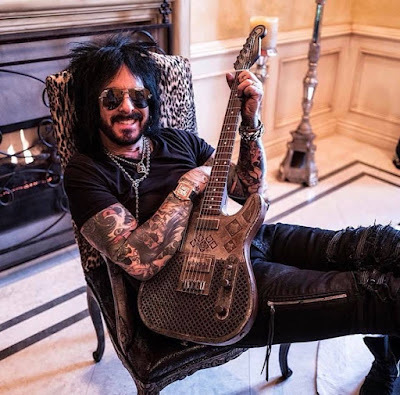 The bassist also recently reunited with Motley Crue to record four new songs for the companion soundtrack album to the band’s forthcoming Netflix biopic, “The Dirt”, based on their 2001 memoir of the same name. Due March 22 and directed by Jeff Tremaine, the film features Douglas Booth as Sixx, Daniel Webber as Vince Neil, rapper Machine Gun Kelly as drummer Tommy Lee, and Iwan Rheon as guitarist Mick Mars.